Giant Swan - Celebrate The Last 30 Years Of Human Ego / IFTLOYL. Vinyl EP. Bleep. Timedance follows on from the excellent Ploy side with two oily techno tantrums from Bristolian up and comers Giant Swan. 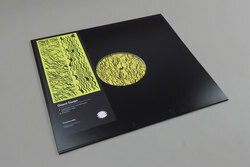 Moving further into the realm of analog techno jackers than previous records have dared tread, Celebrate The Last 30 Years Of Human Ego and IFTLOYL are juggernauts of steam engine room techno, designed for those moments when the DJ shouts taps off!